After a jam-packed holiday season my husband Tim needed a break. So, he went away for the weekend. I was left alone. Well, wait I am never alone. Was I mad at Tim? Nope. It works for us. Besides he isn't the guy who golfs all weekend or goes out to bars. Tim is the guy who doesn't drink and devotes every second of free time to our kids and me. So, he needs a little R and R, I say go for it. And let's face it, we have a lot of kids and they are are really f-ing exhausting. Plus with him gone, I get to watch all my shows on the DVR that he doesn't like and maybe a movie or too. And I get to reclaim my role as the fun parent, or so I thought. Years ago when Tim was an athletic director he worked a lot. Like a lot a lot. He would see the babies maybe one night a week and on Sundays. It was crazy. I was all those babies had. And we made it work. They were little and I was better at being fun to little kids. I had a good balance between getting stuff done and playing. And they were satisfied with a craft or the park and maybe a Bob the Builder cartoon. But as they get older, it gets harder for me to be the fun parent. And since Tim switched jobs and is home more, it has become very apparent that he wins the fun award. So this past weekend was my chance to reclaim the title. It started with a crazy warm day here in Michigan. 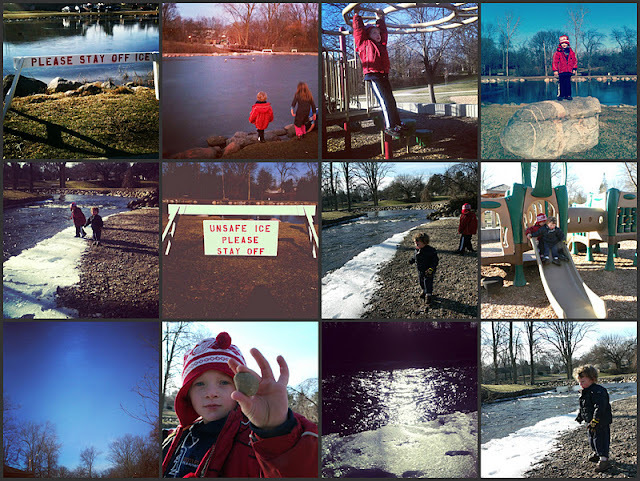 I took the little ones to the park and skipped rocks and played. Fun. The older kids were met with a hug and warm brownies when they got off the school bus on Friday. I wasn't going for fun parent anymore, I was shooting for best parent. Saturday began with an early drop off for my oldest to indoor baseball practice and then off to hockey for JT, my five-year-old. 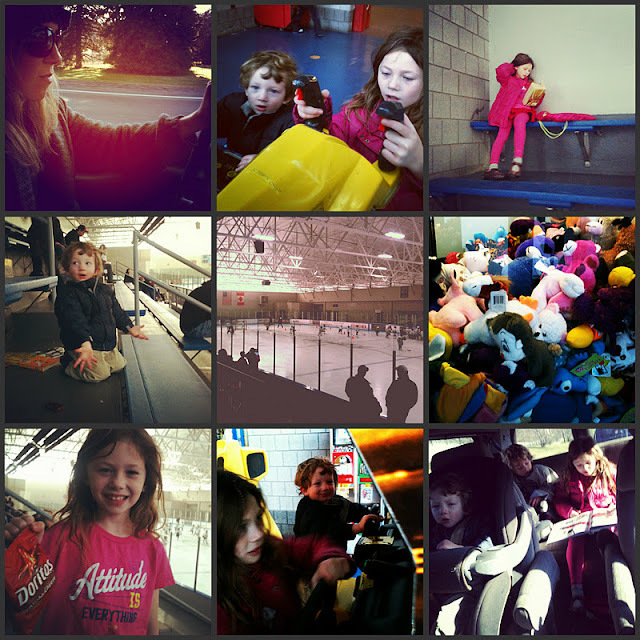 Thank goodness the ice arena is equipped with treats and games...let the good times roll. We were moving and grooving all day. Who needed Tim! I was on a roll as I took Lucy to gymnastics and low and behold there were more candy and treats. I was supposed to be packing for our impending move, supposed to be organizing and acting grown up and responsible. 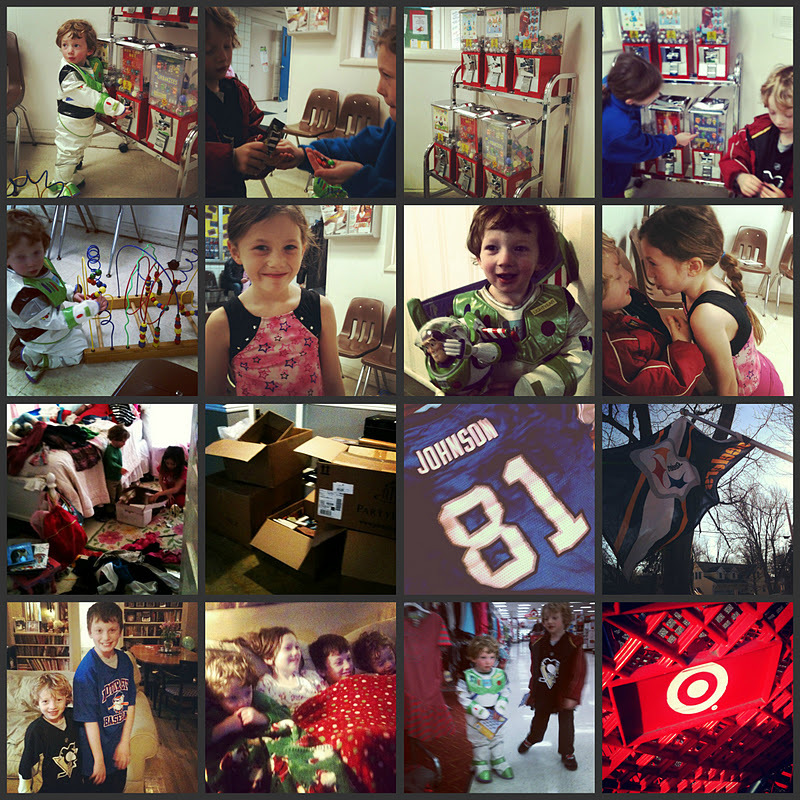 But I was fun and carefree, even buying the boys small toys at a quick trip to Target (hello it was just Christmas!). The boxes sat unpacked and the messy house wasn't cleaned. I mean I get it. 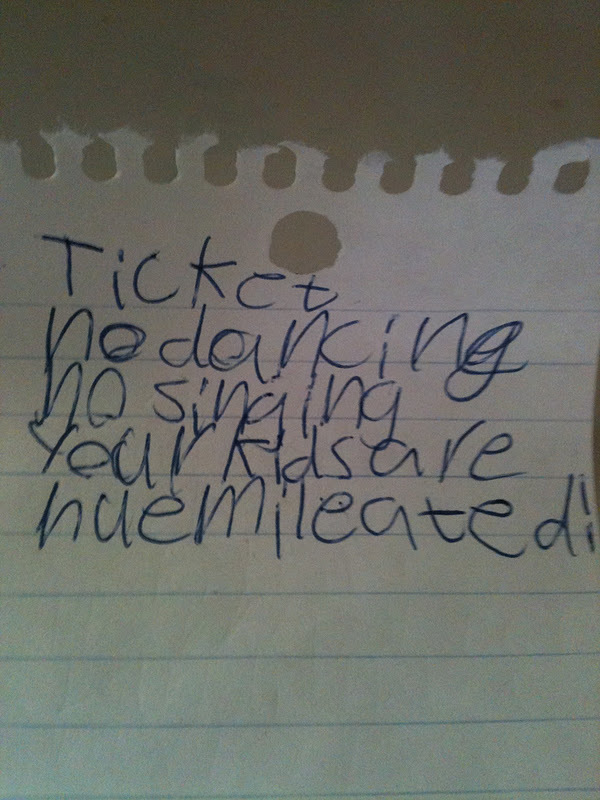 Fun parents never say no. So I didn't. Late Saturday afternoon after happily driving my children all over town, I began to feel pretty impressed with myself. "I still got it," I think I said out loud. Then I put on my "Feel Good" playlist on itunes (yup I give my playlists lame names like that) and started to dance. Problem is, I got a little too cocky and I got ticketed. Lucy was not impressed with me dancing around to Juice Newton's classic "Queen of Hearts" or Rick Springfield's "Jessie's Girl." Yeah, those are on my Feel Good playlist, aren't they on yours? She presented me with the above ticket while plugging her ears and trying to shield her eyes. She was so not only not impressed she was "humileated!" Suddenly, I felt like poor old, weird looking, totally hilarious Rodney Dangerfield. "I get no respect," I said, again out loud to nobody. Waaaaa. Poor me? Nah. I can just relate to Dangerfield's feelings, that's all. One day I know I will do something totally amazing, like a triple lindy off a high dive (like Rodney Dangerfield in Back to School, remember? I'm sure you remember) and totally impress the hell out of my kids. Sure it may not be until they are adults, but it. will. happen. Until then, I will keep buying their love with quarters for the games and candy machines. And at least one weekend, or even only a few hours of one weekend, out of the year I will be the fun parent. But I refuse to stop dancing to "Jessie's Girl" because I never get sick of that song. Never. The movie I chose to watch while Tim was away getting good sleep was Easy A. LOVED IT!!!! So, so much. The main character is a girl after my own heart, at least in this clip. I am very excited to tell the story about how I xanthan gummed finally.